We are happy to announce v5.08.10 of our popular middleware for Delphi and C++Builder. If you like kbmMW, please let others know! Share the word! We strive hard to ensure kbmMW continues to set the bar for what an n-tier product must be capable of in the real world! Notice that kbmMemTable v. 7.81.00 or newer is a prerequisite to this update. This release is primarily a bugfix release. Please check the end of this post for a detailed change list. Professional and Enterprise Edition is available for all with a current active SAU. If your SAU has run out, please visit our shop to extend it with another 12 months. CodeGear Edition may be available for free, but only supports a specific Delphi/Win32 SKU, contains a limited feature set and do not include source. Please visit https://portal.components4developers.com to download. kbmMW is the premiere n-tier product for Delphi, C++Builder and FPC on .Net, Win32, Win64, Linux, Java, PHP, Android, IOS, embedded devices, websites, mainframes and more. 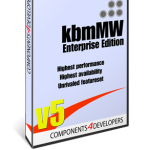 Please visit www.components4developers.com for more information about kbmMW. Components4Developers is a company established in 1999 with the purpose of providing high quality development tools for developers and enterprises. The primary focus is on SOA, EAI and systems integration via our flagship product kbmMW. hospitals, courts, private, industries, offshore industry, finance, telecom, governments, schools, laboratories, rentals, culture institutions, FDA approved medical devices, military and more. New stuff ========= - Added multiple overloaded variants of kbmMWBackupFile method in kbmMWGlobal.pas to allow for more features. - Added boolean properties Modified and Normalized to TkbmMWDuration to make it easy to figure out if a duration normalization needs to be done. - Added support for MaxBackupCount in TkbmMWLocalFileLogManager. Changes/minor additions ======================= - Changed TkbmMWScheduledEvent.GetIntervalMSecs's algorithm in calculating minimum required probe (sampling) interval. - Added class function GetIsManaged(const AValue:TValue):boolean; class function GetIsInterface(const AValue:TValue):boolean; class function GetIsProbablyRefCountedObject(const AObject:TObject):boolean; to TkbmMWRTTI (kbmMWRTTI.pas). - Changed TkbmMWLocalFileLogManager backup handling to use kbmMWBackupFile instead of its own scheme. That includes adding features to specify max number of log backups via the property MaxBackupCount. Default there is no limit. - Added NormalizedInterval to TkbmMWScheduledEvent which returns a normalized interval (TkbmMWDuration). - Added ProbeIntervalMSecs to TkbmMWScheduledEvent which returns the minimum needed probe (sampling) interval (in msecs) to live up to the scheduled events interval settings. Fixes ===== - Fixed TkbmMWScheduler.WaitRuns not waiting at least one run. Amongst others, affected SameFile in TkbmMWFileClient. - Fixed compilation in older SKU's. Tested with XE5. - Fixed compilation for Android. - Fixed some SmartService leak scenarios. - Fixed rounding problem in TkbmMWDuration.Normalize method resulting in slightly off normalized msecs value. - Fixed TkbmMWScheduledEvent.IsTimeToExecute issue resulting in sometimes wandering outside scheduled second intervals due to interval creep. - Fixed some demos. to allow for more features. make it easy to figure out if a duration normalization needs to be done. - Added support for MaxBackupCount in TkbmMWLocalFileLogManager. minimum required probe (sampling) interval. instead of its own scheme. the property MaxBackupCount. Default there is no limit. - Fixed TkbmMWScheduler.WaitRuns not waiting at least one run. Amongst others, affected SameFile in TkbmMWFileClient. - Fixed compilation in older SKU's. Tested with XE5. - Fixed compilation for Android. - Fixed some SmartService leak scenarios. slightly off normalized msecs value. wandering outside scheduled second intervals due to interval creep. 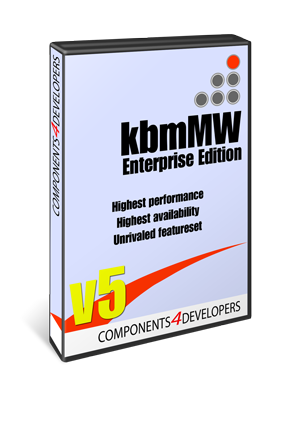 ← ANN: kbmMW Professional and Enterprise Edition v. 5.08.00 released!